Eighteen months ago we embarked upon a total refurbishment of all our bathrooms and replacement of all our beds with super comfy 5 star quality mattresses. 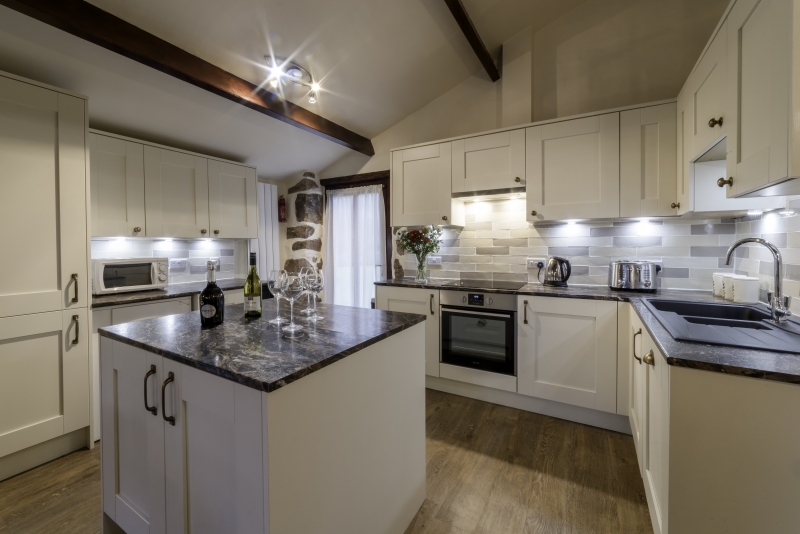 Last autumn we commenced the total refurbishment of all our kitchens along with the purchase of sumptuous Italian leather sofas for most of the cottages and a few new fabric chairs to compliment the sofas. There is only one non new sofa and this is just 18 months old. Plus luxury honey oak Karndean flooring has been installed in all our Eskdale cottages with the exception of the Farmhouse which of course retains its age old flagstones. Many new furnishings have been purchased including a bespoke special shaped table for Scafell Cottage. Showcasing Wastwater Cottage, which sleeps 8-10. The kitchen in Wastwater Cottage used to be separate to the dining and living areas. Well we have removed those stud partitions and opened up the cottage so it has an enormous open plan kitchen, dining area and living room. Don’t worry, the baby grand piano is still there and was recently tuned. The room is so large that the piano, as large as it is, is almost lost in this room which is not only huge in surface area but also in volume with it's high ceiling. Being open plan the natural light is now much better throughout and we have improved the ambient electric lighting too so it really is an amazing cottage full of the Wow! Factor.